This is a tiny bit of a large and fascinating Pleistocene animal from Central and South America. 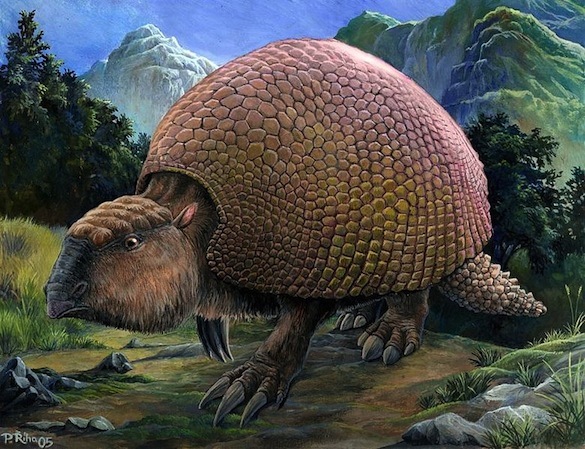 It is Glyptodon, an impressively large mammal with bony armor much like its cousin the armadillo. The above fossil is a fragment of that carapace. Each roundel is called a scute. This is a side view of the above carapace fragment showing its thickness and layered, bony nature. This modern reconstruction of Glyptodon (from Wikipedia with a GNU free documentation license) shows its primary features, including the bony shell (the size and shape of a Volkswagen Beatle, as is often stated) and its characteristically large claws. It belongs to the Superorder Xenarthra, which includes armadillos, sloths and anteaters. I see the resemblance. They could not completely go turtle, as it were, but it could pull its head back enough into the shell that the scutes on the top of the skull would protect it like a cap. They had massive jaws and flat grinding teeth typical of a large herbivore. Its squat skeleton had a variety of features to support the heavy shell, including fused vertebrae and elephant-like short, stout limbs. They went extinct only about 10,000 years ago, possibly having been hunted to oblivion by early Americans. There is even some evidence that people used their empty shells as shelters. Glyptodon was formally named as a genus in 1839 by the extraordinary Sir Richard Owen (1804-1892). Owen was a giant of natural history through most of the 19th Century. He is most remembered for inventing the term Dinosauria (“terrible lizards”) and for being on the wrong side of history at the beginning of the Darwinian Revolution. He was apparently ambitious to the point of severity, and very tough on his contemporary scientists. Thomas Henry Huxley, for example, despised Owen for his treatment of his colleagues. Ironically, Huxley did considerable work on further describing Glyptodon in 1865. Owen had vision as well as sharp observational skills. He was a primary force in the eventual establishment of the Natural History Museum in London in 1881. It can be argued that this museum set the high standards of accessibility and research we now expect from all such institutions. 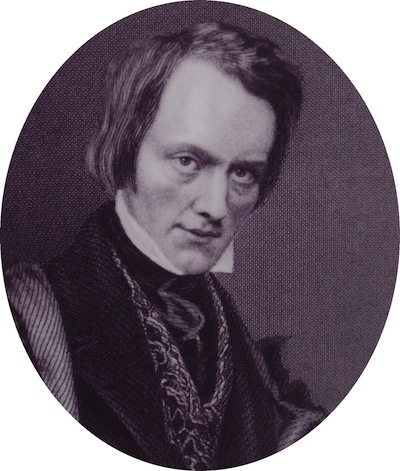 Sir Richard Owen is such a large and well known figure I can simply refer you to one of many websites describing Owen’s life and contributions. This post marks three complete years of Wooster’s Fossil of the Week. That’s 156 posts. 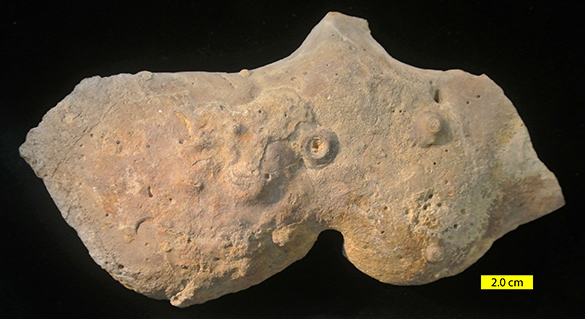 You can visit the very first post (about a Devonian tabulate coral) and see how the entries have evolved, so to speak. We still have plenty more fossils to describe! Gallo, V., Avilla, L.S., Pereira, R.C. and Absolon, B.A. 2013. Distributional patterns of herbivore megamammals during the Late Pleistocene of South America. Anais da Academia Brasileira de Ciências 85(2): 533-546. Huxley, T.H. 1865. On the osteology of the genus Glyptodon. Philosophical Transactions of the Royal Society of London 155: 31-70. Oliveira, É.V., Porpino, K.O. and Barreto, A.F. 2010. On the presence of Glyptotherium in the Late Pleistocene of northeastern Brazil, and the status of “Glyptodon” and “Chlamydotherium“. Paleobiogeographic implications. Neues Jahrbuch für Geologie und Paläontologie-Abhandlungen 258(3): 353-363. Owen, R. 1839. Description of a tooth and part of the skeleton of the Glyptodon, a large quadruped of the edentate order, to which belongs the tessellated bony armor figured by Mr. Clift in his memoir on the remains of the Megatherium, brought to England by Sir Woodbine Parish. FGS Proceedings of the Geological Society of London 3: 108-113. College of Wooster student Willy Nelson spotted and collected up this beautiful Liberty Formation slab on our 2013 Invertebrate Paleontology course field trip to the Upper Ordovician of the Caesar Creek area in southern Ohio. 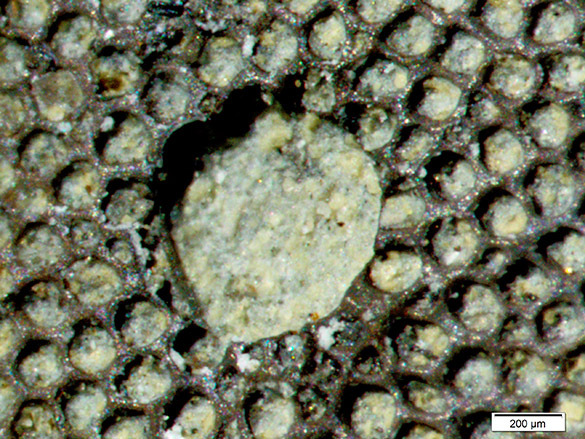 There are many exquisite fossils on this apparent carbonate hardground (a cemented seafloor), the most prominent of which are the four linked circular corallites in the top center. They are of the species Streptelasma divaricans (Nicholson, 1875), shown in more detail below. 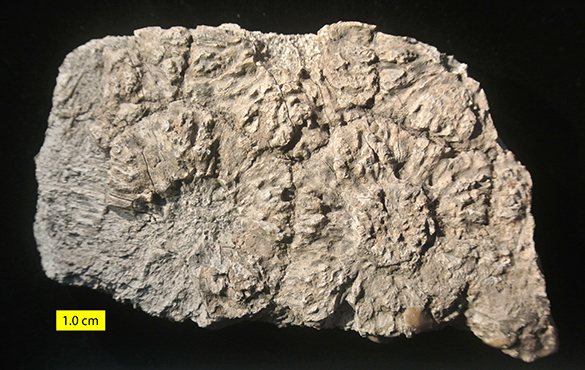 Streptelasma divaricans is a rugose coral, a prominent order that dominated the Paleozoic coral world from the Ordovician into the Permian. Unlike most rugose corals, it usually is found attached to some hard surface like a shell, rock or hardground. 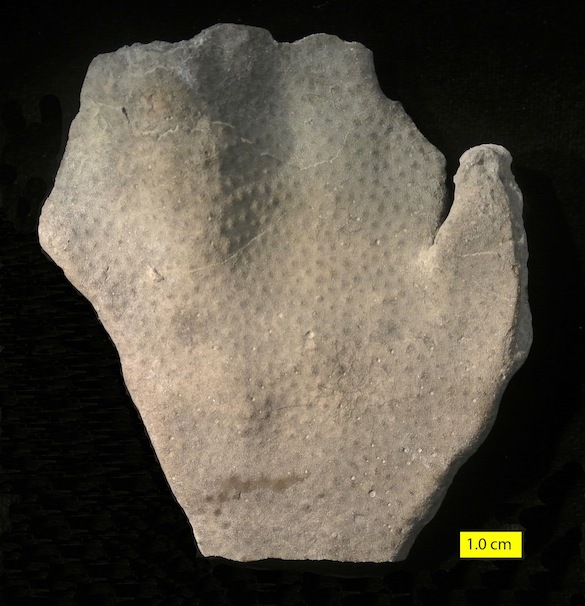 S. divaricans is relatively rare in the Upper Ordovician of the Cincinnati area compared to its free-living cousin Grewingkia canadensis. In its adult form (as seen here) it can have about 60 septa (vertical partitions radiating from the center), alternating from small to large and often with a twist at the center. In life there would have been a tentacle-bearing polyp sitting in each of these septate cups (corallites) catching tiny prey as it passed by in the water currents. We presume that they lived much like modern corals today. 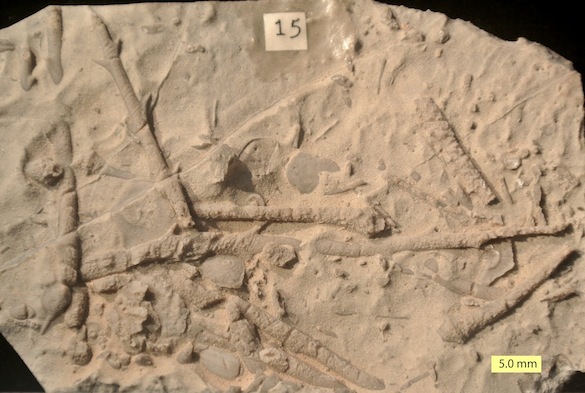 S. divaricans was, by the way, an invading species in this Late Ordovician shallow sea community. Streptelasma divaricans was named as Palaeophyllum divaricans in 1875 by Henry Alleyne Nicholson (1844-1899). We met Dr. Nicholson in an earlier blogpost. Astonishingly, one of our geology majors in the paleontology course this semester is Brittany Nicholson, a direct descendant. Way cool. Another nice fossil on Willy’s slab (in the upper right) is the rhynchonellid brachiopod Lepidocyclus perlamellosus, shown closer above. 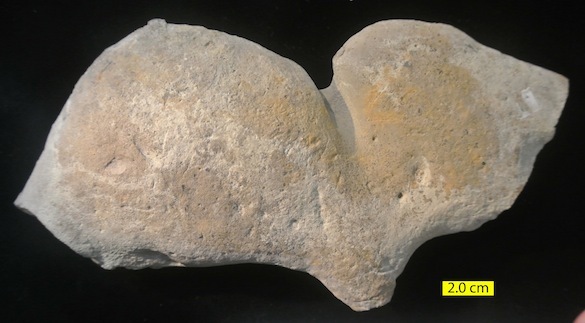 The curved, indented line in the middle of the slab (shown above) appears to be the outline of a bivalve shell. The original shell was made of aragonite and thus dissolved away very early (possibly even on the seafloor before burial). There is not enough shape remaining to identify it. 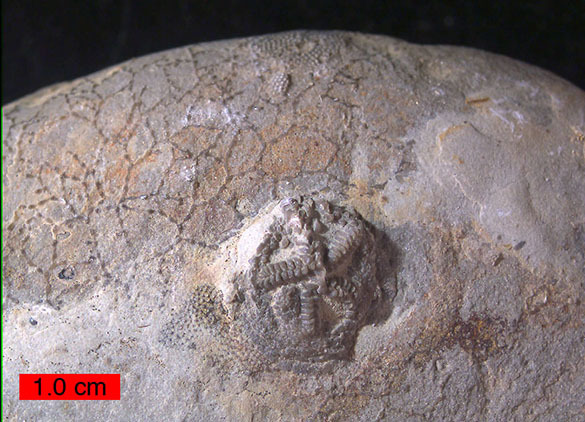 The twig-like fossil with tiny holes above the scale is, of course, a trepostome bryozoan. You didn’t need me to tell you that! Elias, R.J. 1983. 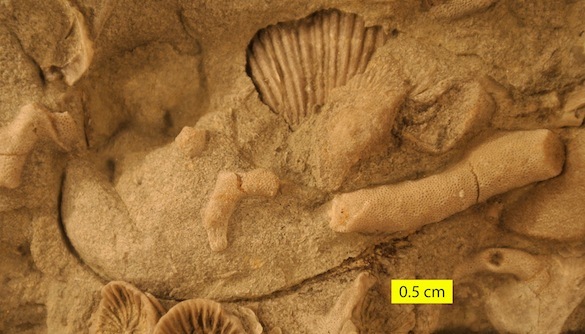 Middle and Upper Ordovician solitary rugose corals of the Cincinnati Arch region. United States Geological Survey Professional Paper 1066-N: 1-13. Elias, R.J. 1989. 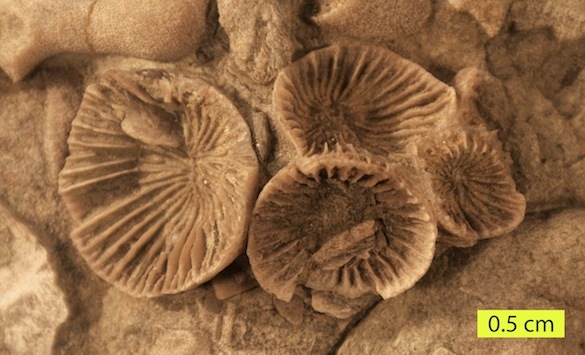 Extinctions and origins of solitary rugose corals, latest Ordovician to earliest Silurian in North America. 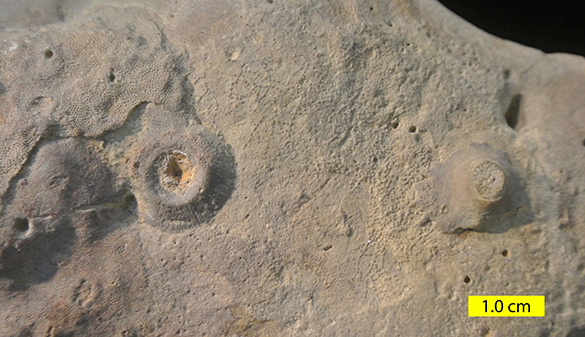 Fossil Cnidaria 5: 319-326. 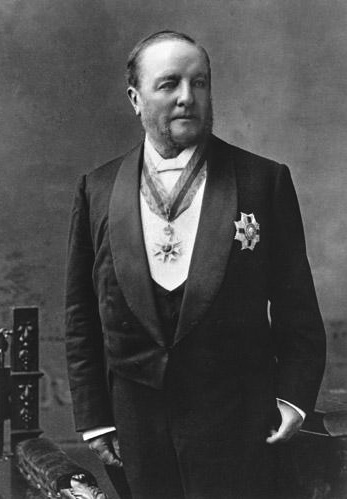 Nicholson, H.A. 1875. Description of the corals of the Silurian and Devonian systems. Ohio Geological Survey Report, v. 2, part 2, p. 181-242. Patzkowsky, M.E. and Holland, S.M. 2007. Diversity partitioning of a Late Ordovician marine biotic invasion: controls on diversity in regional ecosystems. Paleobiology 33: 295-309. 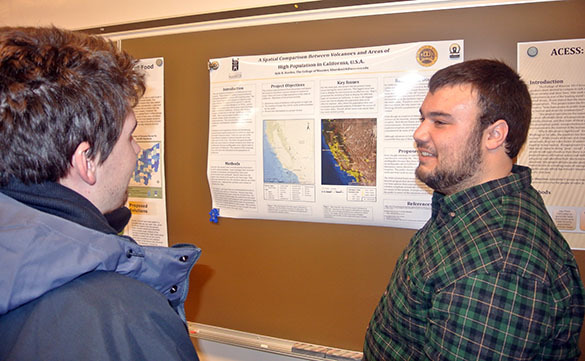 SAN FRANCISCO, CA – Today was a big day for Wooster Geologists Alex Hiatt (’14) and Mary Reinthal (’16). 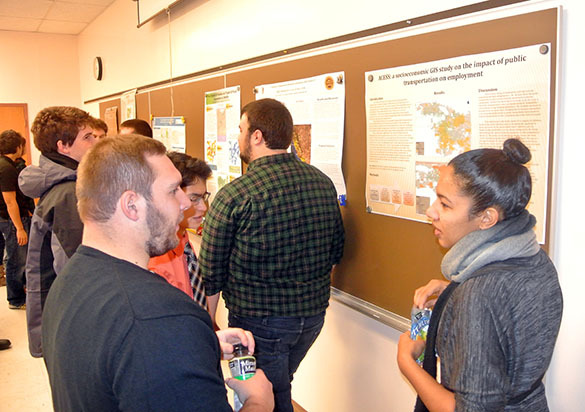 They presented their work on subglacial volcanic ridges, along with Ellie Was (’14, Dickinson College). 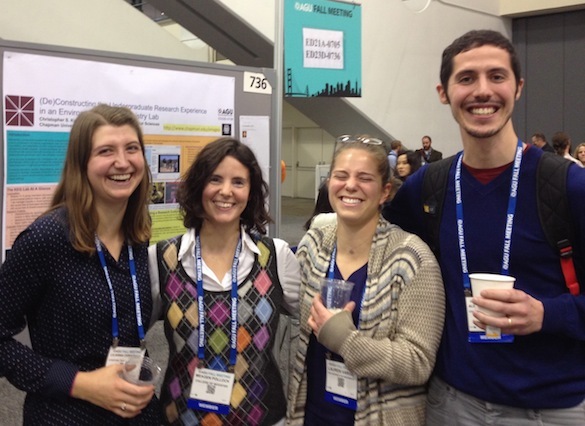 Ellie (left), Mary (center), and Alex (right) presented their posters in a physical volcanology session at AGU 2013. 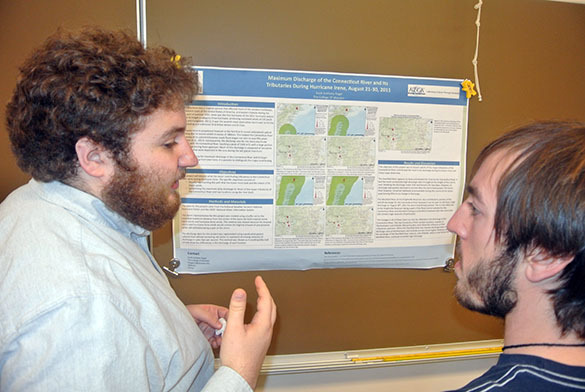 You may remember these fantastic undergraduate researchers from last summer’s field season. They’ve been hard at work since then, processing the images and samples that we collected. Ellie was lead author on a poster titled, “Along-axis variations in volcanology and geochemistry of a pillow-dominated tindar: Comparison of exposures in Undirhlithar and Vatnsskarth quarries, Reykjanes Peninsula, Iceland.” She carefully traced individual pillow lavas on Gigapan images and constructed the first ever (we think) pillow-size distribution. Her work can help us understand permeability and fluid flow in pillow-dominated crust. Alex was lead author on a poster titled, “Estimated hydrostatic/cryostatic pressures during emplacement of pillow lavas at Undirhlithar quarry, Reykjanes Peninsula, southwest Iceland.” He is conducting a high-resolution FTIR study of volatiles in the quenched glass rims of basaltic pillow lavas. His ultimate goal is to estimate quench pressures and, by extension, ice thickness. Thanks to all of those who visited his poster this morning and offered excellent suggestions for next steps! SolEx: SolEx is a model that we’ll be able to use to calculate CO2 and H2O solubility in basaltic melts at low pressures. Thanks to Dr. Jacqueline Dixon for pointing us to it! Northeast National Ion Microprobe Facility (NENIMF): Since SolEx takes into account melt composition and total volatiles, like S and Cl, we might be interested in using the SIMS at NENIMF to analyze our glasses in the future. Thanks to Dr. Adam Soule for sending us to the NENIMF booth in the exhibit hall. 3-D Photogrammetry: Some researchers have used 3-D photogrammetry of oblique photos taken from aircraft to trace inaccessible lava flows near the tops of mountains in eastern Iceland. Our solution in the quarries has been to combine Gigapan with high-precision GPS and laser range finder. Perhaps the 3-D photogrammetry approach could be useful. 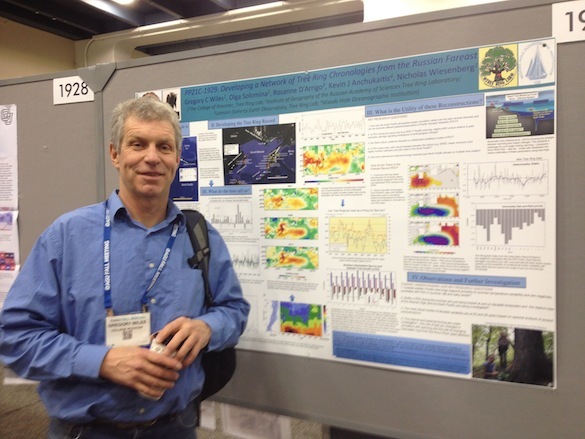 SAN FRANCISCO, CA – The Fall Meeting of the American Geophysical Union is once again taking place the festive city of San Francisco. Mild weather and sunny skies have greeted the 22,000+ geoscientists who have traveled from across the globe to participate in the meeting. Among the crowd are many Wooster geologists. Alumni Nicolas Young, Lauren Vargo, and Katharine Schleich joined Dr. Wiles and me for an informal alumni lunch. Lily Christman (left) caught up with us in the afternoon at the Wooster IS poster. I introduced them to another former student of mine, Alex Lloyd (right), who was a student at Dickinson College when I taught there in a visiting position. Pictured in the center are Lauren Vargo (center right) and me (center left). The conference isn’t just about networking and reconnecting with old friends. We’re primarily here to contribute to the dialogue of our scientific disciplines. On behalf of the department, I presented a poster in an education session about best practices in the I.S. program (thanks to all of those who stopped by!). 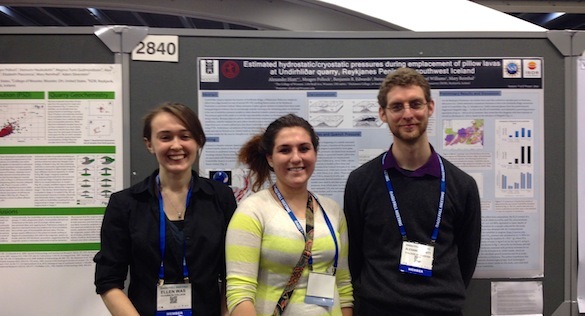 Alex Hiatt (’14) and Mary Reinthal (’16) will be presenting their work on subglacial volcanics on Thursday. 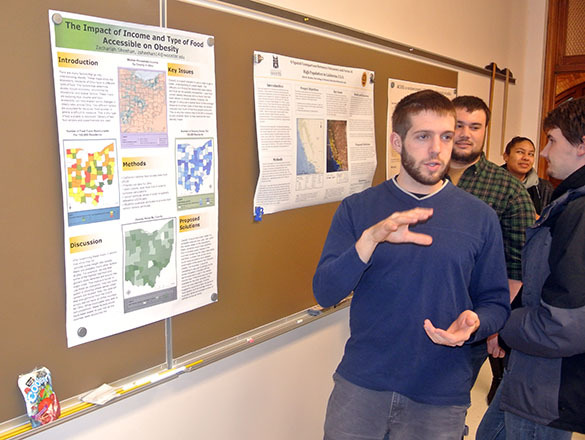 Dr. Greg Wiles presented the work that he and his collaborators have been doing in Russia. They are constructing tree-ring records to understand decadal variability in climate. 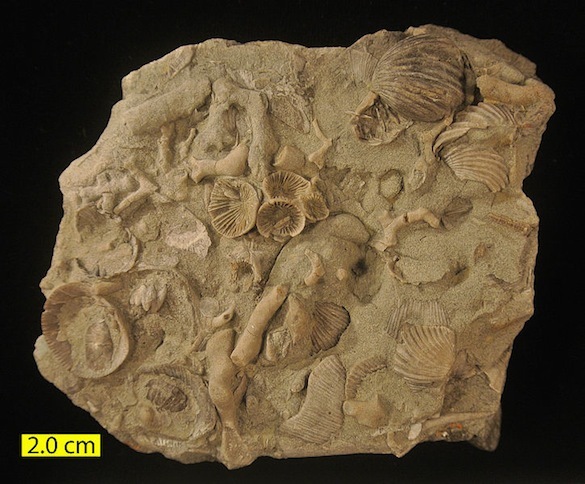 3-D Fossils: The British Geological Survey has 3-D images and scans of fossils. If you have a 3-D printer, you can download the scan files and print a fossil for yourself! (How cool is that? I’m thinking Dr. Mark Wilson will have a need for our newly acquired 3-D printer soon). A New Lava Flow Simulation: There’s a new simulation of lava flow emplacement that better reproduces the features characteristic of inflated pahoehoe flows. 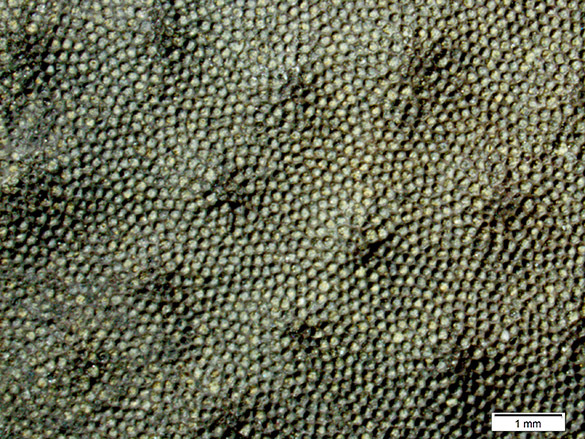 Check out the paper by Glaze and Baloga (2013), JVGR, 255, 108-123. Comprehensive Field Camp: The Southern Illinois University field camp exposes students to four tectonic settings. With sites in Grand Teton National Park, yellowstone, and Craters of the Moon National Monument, who wouldn’t want to do field camp with SIU? Volcanic Hazards in California: The USGS has released a digital compilation of the volcanic vents and associated hazards in California. The digital database contains ArcGIS files ready for download. Games for Teaching: Programmers are teaming up with geoscientists to create interactive games and simulations to teach everything from hazards to conservation. Naranpur Online, for example, is a socio-economic role-playing game informed by the science of hydrology that could be useful for connecting courses across disciplines. This rock has been in my Invertebrate Paleontology course teaching collection since I arrived in Wooster. I collected it way back when I was doing my fieldwork for my dissertation on the biostratigraphy and paleoecology of the Bird Spring Formation (Carboniferous-Permian). This specimen comes from Kyle Canyon in the Spring Mountains west of Las Vegas, Nevada. It is from the Upper Carboniferous part of the Bird Spring. It is up this week in honor of Jeff Thompson, a new graduate student at the University of Southern California beginning his thesis work on Paleozoic echinoids. 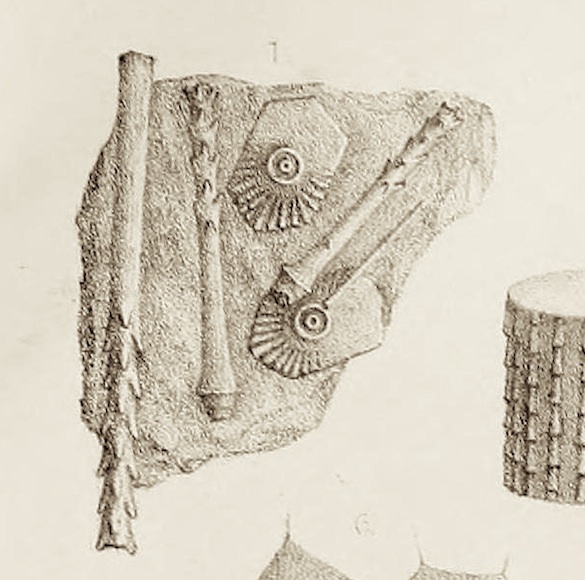 These are spines and test plates from the echinoid Archaeocidaris M’Coy, 1844. There are many far more attractive specimens known of Archaeocidaris, so consider this a more average view of what you’re likely to find in the fossil record. The test plates are polygonal and the spines have characteristic outward-directed thorns on them. This particular specimen was disarticulated after death in a shallow, possibly lagoonal environment. Cidaris urii Fleming, 1828, p. 478, by subsequent designation of Bather 1907, p. 453. 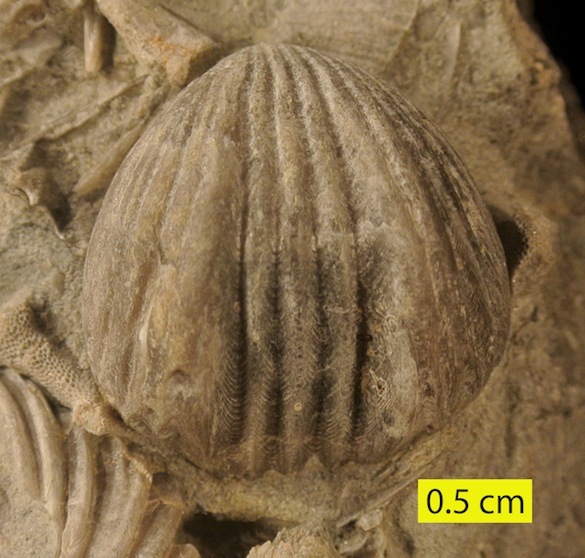 Generic name Archaeocidaris validated in Opinion 370 under plenary powers, by suppression under same powers of generic name Echinocrinus Agassiz, 1841. Opinions of the International Commission of Zoological Nomenclature 1955, 11, 301-320. In any case, you can see how closely this illustration of an Irish fossil resembles our fossiliferous slab from the Spring Mountains. Ireland is far from Nevada now, but in the Carboniferous they were considerably closer. M’Coy, F. 1844. A synopsis of the characters of the Carboniferous limestone fossils of Ireland. Dublin, Printed at the University Press by M.H. Gill. Rushton, A. 1979. The real M’Coy. Lethaia 12: 226. Wyse Jackson, P.N. and Monaghan, N.T. 1994. Frederick M’Coy: an eminent Victorian palaeontologist and his synopses of Irish palaeontology of 1844 and 1846. Geology Today 10: 231-234.